If you are looking for how to respond to Sales Tax GST Recovery Notice / Show Cause Notice for non Filing of GST Return/ Cancellation of Registration / Mismatch in input credit etc, you are at right place. Below you can download a highly professional response letter / Email for any sales tax notice. Ref: Your letter no. 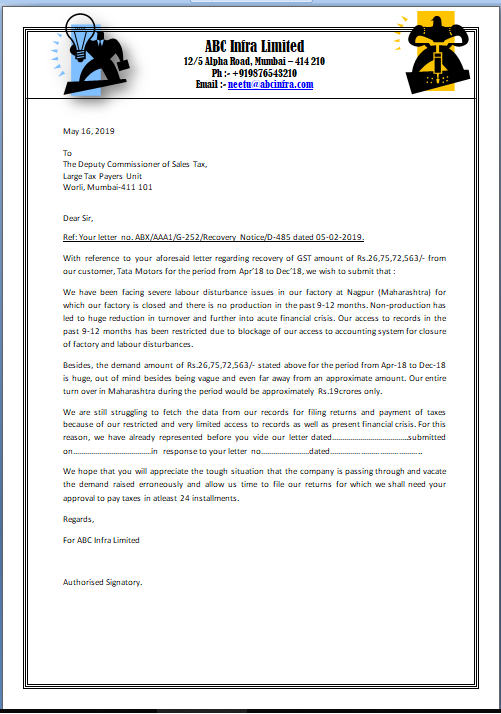 ABX/AAA1/G-252/Recovery Notice/D-485 dated 05-02-2019. We have been facing severe labour disturbance issues in our factory at Nagpur (Maharashtra) for which our factory is closed and there is no production in the past 9-12 months. Non-production has led to huge reduction in turnover and further into acute financial crisis. Our access to records in the past 9-12 months has been restricted due to blockage of our access to accounting system for closure of factory and labour disturbances. Besides, the demand amount of Rs.26,75,72,563/- stated above for the period from Apr-18 to Dec-18 is huge, out of mind besides being vague and even far away from an approximate amount. Our entire turn over in Maharashtra during the period would be approximately Rs.19crores only. We are still struggling to fetch the data from our records for filing returns and payment of taxes because of our restricted and very limited access to records as well as present financial crisis. For this reason, we have already represented before you vide our letter dated………………………………..submitted on…………………………………in response to your letter no……………………dated……………………………………..
We hope that you will appreciate the tough situation that the company is passing through and vacate the demand raised erroneously and allow us time to file our returns for which we shall need your approval to pay taxes in atleast 24 installments.